Perfect for taking to church or using at home, young children will love this beautifully illustrated first Bible. "A Child's First Bible" is a collection of 125 of the most familiar Bible passages, from both the Old and New Testaments. Beginning with the story of Creation and ending with Revelation, the text is retold in simple words by well-known author and translator Kenneth N. Taylor. With its charming illustrations and clear, inspiring text, "A Child's First Bible" is a must for every child's bookshelf. "Jacob played a mean trick on his brother. Later, Jacob told Esau he wanted to be friends again. Esau ran to meet Jacob and they hugged each other!" Simple text and serene illustrations make this storybook an ideal way to introduce your very young children to Bible passages. 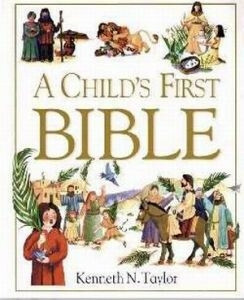 A Child's First Bible is a collection of 125 well-known Bible stories retold by Dr. Kenneth Taylor. Simple questions at the end of each selection are designed to highlight important truths. Perfect for taking to church or using at home, this colorfully illustrated first Bible is sure to be a favorite with young children. Recommended for ages 2 to 6, 262 pages.